Assembly Elections 2018 LIVE Updates: Bharatiya Janata Party chief Amit Shah on Monday asked Rajasthan voters to choose between "patriotic" BJP and "no policy" Congress. "On one hand, there is a party of patriots led by Modi ji, on the other hand, it is Congress party under Rahul baba's leadership, which has no policy or principles," he said in Chittorgarh. Meanwhile, Prime Minister Narendra Modi is set to address a public meeting in Jodhpur, while Congress president Rahul Gandhi will tour poll-bound Rajasthan on Tuesday. CNN name, logo and all associated elements ® and © 2016 Cable News Network LP, LLLP. A Time Warner Company. All rights reserved. Amit Shah is currently addressing a public rally in Chittorgarh. " While BJP is a party of patriots, on other hand, Rahul Gandhi's Congress party is directionless and lacks any kind of morals and principles," he said. 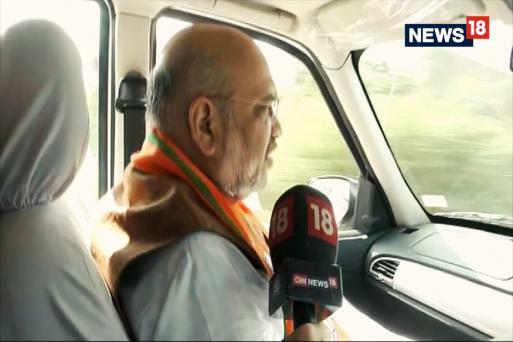 Shah Offers Prayers Ahead of Chittorgarh Rally | BJP President Amit Shah offered prayers at Sanwaliya Seth Temple in Chittorgarh ahead of his public rally on Monday. PM to Address Public Meeting in Jodhpur on Monday | Prime Minister Narendra Modi and Congress president Rahul Gandhi will campaign in poll-bound Rajasthan in the next couple of days. The prime minister will address public meeting at Jodhpur on December 3 and in Hanumangarh, Sikar and Jaipur on December 4, a BJP spokesperson said.The Congress president will tour the state on December 4,during which he will address public meetings at Malakhera of Alwar district, Surajgarh of Jhunjhunu district and Salumber of Udaipur district, a Congress spokesperson said. He also claimed the Telangana Rashtra Samithi was the BJP's "B team" and its chief K Chandrasekhar Rao "operates" as Prime Minister Modi's "Telangana Rubber Stamp". "Owaisi's, AIMIM is the BJP's 'C' team, whose role is to split the anti BJP/KCR vote," Gandhi tweeted. "Great people of Telangana, Modi, KCR & Owaisi are one. They speak in twisted tongues. Do not be fooled by them!" he said. Earlier, in an another tweet, he said Telangana was "born of idealism and great dreams", but four years of "TRS/BJP incompetence, arrogance and corruption" has made the people cynical. Accusing the NDA government of harassing political rivals through agencies life the CBI and the Income Tax department, TDP Chief N Chandrababu Naidu on Saturday said he joined hands with Congress president Rahul Gandhi and other opposition leaders to work in national interest. Speaking during a roadshow in the city, Naidu criticised the NDA government for demonetisation, "faulty implementation" of GST and price rise and alleged that there was a feeling of insecurity. "Today, the government led by Narendra Modiji in the country is indulging in attacking political rivals. They are harassing rivals as per will. "If anyone questions, (they) send Enforcement Directorate, CBI, Income Tax. Attacks on media. Attacks on political leaders. By carrying out attacks on business organisations, creating fear, (they) wish to see that nobody speaks," the Andhra Pradesh Chief Minister said. Bharatiya Janata Party (BJP) chief Amit Shah compared the Congress with an automated teller machine (ATM), saying that it was a machine of "lies". "The Congress is an ATM of lies, whereas the BJP is an ATM of development," Shah said, while addressing an election rally in Balotara town in Rajasthan's Barmer district. He said the saffron party was a "development ATM", where problems were resolved once it was brought to notice. Asking the Congress to clear its stand on the Ayodhya dispute, the BJP chief said: "I want to make it clear that the BJP wants to build a grand Ram temple at the earliest (at the disputed site)." Former Union Minister and Congress leader Jitin Prasad Saturday alleged that the Telangana Rashtra Samiti (TRS) government in Telangana has failed on all parameters in the last five years and said the Congress party would form the next government in the state. Addressing a press conference here, he said the TRS chief and caretaker Chief Minister of the state K Chandrasekhar Rao was running a dictatorial regime. Retaliating to Congress chief Rahul Gandhi's Hindu remark on PM, External Affairs minister Sushma Swaraj accused the Congress of changing their mindset as they realise "hindus are a majority in India." She said that the COngress is comfused and the morale of the party is down, and duwidhagrasth congress is not winning the BJP-ruled states. "The congress party is loosing badly." she added. A Congress delegation met the Election Commission on Saturday and raised concern over the security of EVMs inside strong rooms and their handling during the counting process in Madhya Pradesh and Chhattisgarh, and the alleged deletion of voters in Uttar Pradesh. Talking to reporters after meeting the Election Commission, Congress leader and AICC's Chhattisgarh in-charge P L Punia said suspicious activities were being reported in the Dhamtari Assembly seat in the state. He claimed suspicious people with laptops and mobile phones were seen around the strong rooms, where Electronic Voting Machines (EVMs) were kept after the voting, on the pretext of repairing the CCTVs. The party has also lodged a complaint with the Chief Electoral Officer in Raipur regarding this, Punia said. "As far as the ongoing Assembly polls are concerned, the BJP will form governments on its own in Madhya Pradesh, Chhattisgarh and Rajasthan. "In Mizoram, the Congress is going to suffer a defeat, while pro-BJP forces will form the government in the north-eastern state. And as far as Telangana is concerned, the Congress's ideology will come to an end. In other words, the Congress will effectively be wiped out from all the five states," Sharma said. Taking a dig at the Congress chief, he said, "Rahul Gandhi will make a new record in terms of (electoral) defeats." While the elections have already been held in Madhya Pradesh, Chhattisgarh and Mizoram, Rajasthan and Telangana will go to the polls on December 7 and the results for all the five states will be announced on December 11. Claiming that the Congress will face defeats in the ongoing Assembly polls in five states, the BJP Saturday said after the results are out, Rahul Gandhi, the chief of the opposition party, will make a new record of electoral defeats. "One thing is certain in these Assembly elections and that is the Congress is going to lose in all the five states. The reason for this is the belief the people of the country have reposed in Prime Minister Narendra. The impact of the work done by the prime minister can be seen across the country. The various welfare works of the Centre have benefitted the poor, farmers, the deprived and marginalised sections of the society and have a direct positive impact on their lives," Uttar Pradesh Deputy Chief Minister Dinesh Sharma said. "In RafaleDeal Rs 30,000 crore were stolen from the Air Force and put in Anil Ambani’s pocket," said Rahul Gandhi while addressing a rally in Chittorgarh of poll-bound Rajasthan. He also told the gathering, "Like during the Narendra Modi government, surgical strike was conducted thrice during Manmohan Singh government. Are you aware of it? Modi actually reached into the Army's domain and shaped surgical strike into a political asset. "Hitting out at the Congress, Shah said, "On one hand there is a troop of patriots under leadership of Narendra Modi and on the other hand there is a troop which doesn't have a leader, policy and principles. "He also took a dig at Gandhi's party for not declaring its chief ministerial candidate, and wondered how can an "army" win which has not been able to finalise its leader. "Prime Minister Narendra Modi took revenge for Army martyrs. Rahul Gandhi is saying that surgical strike was conducted to win Uttar Pradesh election. You insult the martyrs of the country. You could not even show some courage," Shah said at a public meeting in Phalodi town of Jodhpur district in Rajasthan. Addressing a gathering at Udaipur in poll-bound Rajasthan earlier Saturday, Rahul Gandhi alleged that the surgical strike was made public as the BJP was fighting elections in Uttar Pradesh. BJP chief Amit Shah Saturday alleged that Congress president Rahul Gandhi was insulting slain Army soldiers by claiming that the 2016 surgical strike across the LoC was conducted to win the Uttar Pradesh Assembly elections. He said that today Army jawans have developed a sense of pride that their government is standing behind them rock solid. Rahul alleged that PM Modi doesn't understand the foundation of Hinduism while he was addressing the business community in Mewar district of Rajasthan. "What is the essence of Hinduism? What does the Gita say? That knowledge is with everybody, knowledge is all around you. Every living being has knowledge. Our PM says he is a Hindu but he doesn't understand foundation of Hinduism. What kind of a Hindu is he?" Rahul Gandhi said. Abhishek Singhvi reacted to Rahul's earlier statement and said, "He is right. I'm a proud Hindu. I don’t think proud Hindus behave as they're being taught to behave by minority of those who claim to be Hindu." "No one is prohibited to dream, but do we dream in daylight?" said Amit Shah as he took a dig at Rahul Gandhi. "Congress is staring at a total wipe out this time, as nobody can replace BJP in Rajasthan," Amit Shah said, as he went on to add that soon enough, the name of Congress will be wiped off the entire political landscape of India. "BJP has worked extensively towards the development of people in Rajsthan and everywhere else," he said. "BJP'S foothold in Rajasthan is like Angad's foot, it cannot and will not budge," Shah said. He said that Rahul Gandhi seems to have forgotten the polling history of the past four and a half years in Rajasthan, when every single time, the BJP emerged victorious. The crowd erupted in cheers at this point and chanted Modi's name. Shah is currently addressing a mega rally in Philod district of Jodhpur. BJP Chief Amit Shah Addresses Rally in Jodhpur | BJP chief Amit Shah is currently addressing a rally in Phalodi district, Jodhpur ahead of the Assembly election of Rajasthan of December 7. He began the rally by evoking Durgadas Rathore, as he went on to say that the Congress party has no leader or any principles. "Congress is daydreaming if they think they can win the Rajasthan elections," he said. Rajasthan BSP Candidate Dies | Weeks before polling, BSP candidate in Alwar district's Ramgarh constituency in Rajasthan died of cardiac arrest two days ago. Following the death of Laxman Singh, 62, elections will now take place in 199 out of the total 200 assembly seats in Rajasthan. "BSP candidate Laxman Singh died Thursday morning. Elections are postponed on death of any candidate and next date of election on the seat will be notified by the Election Commission of India," Pankaj Kumar, returning officer of Ramgarh said. Rajasthan Congress president Sachin Pilot has accused the BJP of raking up the mandir-masjid debate 10 days before the elections as they have nothing to show in terms of their work. 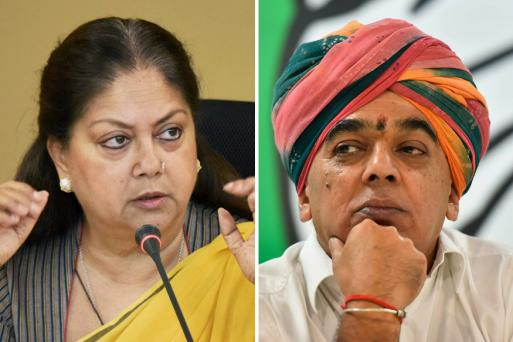 Pilot, who is being seen as the CM face by many, accused Vasundhara Raje government of being corrupt and not having acted swiftly on the anti-social elements. He went on to say that nobody knew the word lynching four years ago and that CM vasundhara Raje failed to act on the matter. Sachin Pilot, who was in conversation with CNN-News18's Zeba Warsi, exuded confidence that the next CM will be from the Congress. He said CM Vasundhara will have to pay for her actions and the campaigns by PM Modi and Amit Shah will not be able to save her. Besides the rally in Jodhpur, PM Modi will campaign in Hanumangarh, Sikar and Jaipur on December 4, a BJP spokesperson said. The Congress president will tour the state on December 4, during which he will address public meetings at Malakhera of Alwar district, Surajgarh of Jhunjhunu district and Salumber of Udaipur district, a Congress spokesperson said. Meanwhile, in Telangana, Gandhi alleged that the prime minister, TRS chief K Chandrasekhar Rao and AIMIM leader Asaduddin Owaisi were "one" and urged the people of Telangana to not be "fooled by them". "Owaisi's, AIMIM is the BJP's 'C' team, whose role is to split the anti BJP/KCR vote," Gandhi tweeted. "Great people of Telangana, Modi, KCR & Owaisi are one. They speak in twisted tongues. Do not be fooled by them!" he said.